At the Yankee Mattress Factory in Agawam, MA, we make the original Yankee Mattress the way we always have; by hand. We’re a New England Company through and through, with a commitment to quality and respect for thrift. We make all of our products locally under one roof and sell them at factory-direct prices in our stores in Agawam, Springfield, Northampton and Greenfield. 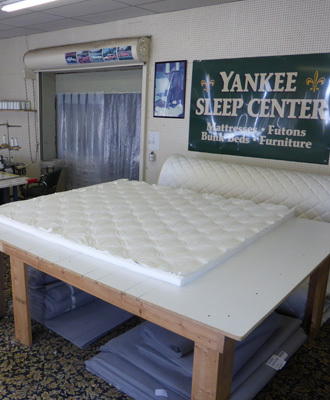 Yankee Mattress handcrafts thousands of mattresses each year in our Agawam factory. We insist on using only the best materials because it's the only way to produce the best mattress. Our process is painstaking in its attention to detail and, unlike big factories that turn out hundreds of mattresses per day, we take all the time that is needed to make each mattress perfect. High quality materials with great customer service is the reason Yankee Mattress has grown significantly over the past 19 years. The quality of our products, our factory-direct prices and our friendly, no-pressure customer service have won us the Valley Advocate’s Best of the Valley Readers’ Poll in the Material World category as"Best Local Mattress Store" in 2010, 2011, 2012, 2013, 2014, 2015, 2016, 2017 and 2018 as well as the #1 spot in the Prime Buyer’s Report® on “Best Mattress Stores in Hampden County.” We were voted #1 Mattress Store in the Hampshire Gazzette's "Reader's Choice Awards" in 2014, 2015, 2016, 2017 and 2018. The "Greenfield Recorder also voted us #1 Mattress Store in their 2015, 2016 and 2017 issue of "Reader Favorite's". You’ll find Yankee Mattresses in many area hotels and B&Bs. In fact, we have had many guests call us after their stay to order a mattress! Check out a list of where our mattresses are featured HERE. From the selection of the materials to final delivery, every aspect of your Yankee Mattress Factory experience is guaranteed to please.